Bitcoin price surges higher at the end of Q1, following an increase in trading volumes among other positive fundamental events and technical price patterns that unfold. Join us this week as we take a look at a buildup of the price, by carrying out a top-down analysis as well as touch on some recent speculative news announcements. According to a recent weekly cryptocurrency report from Diar on 08 April, ’19 that focuses on the CME, CBOE, and GBTC, trading institutional Bitcoin investment products sees an increase for the fourth month in a row, as well as growing against US-based bitcoin trading platforms. The data reveals a steady month-month growth of institutional BTC products, starting with a 15% increase in January ’19, 17% in February ’19, 18% in March ’19 and presently 19% in April ’19. CnLedger, a social media news portal on 07 April reported the return of Chinese traders to the cryptocurrency market and didn’t mind paying a premium to purchase bitcoin. Following China’s ban on cryptocurrency trading in 2017, investors resort to buying stablecoins e.g USDT on OTC services and have them converted to cryptocurrencies. 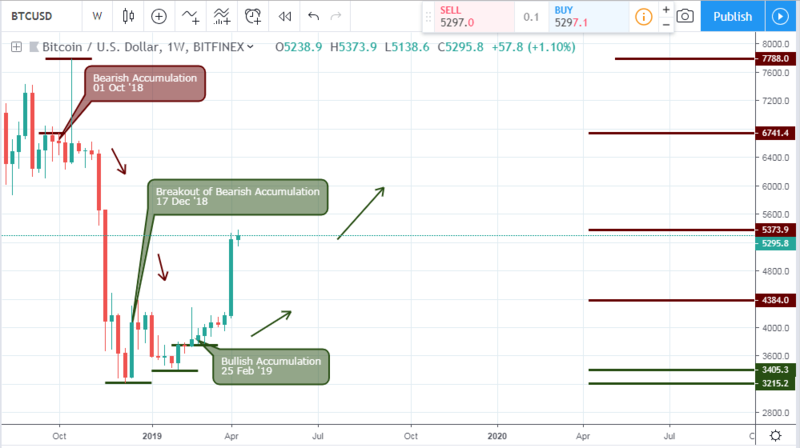 Going back to the year 2017, precisely July, the bitcoin price signaled a double bullish accumulation pattern, which resulted in a 592.11% price increase. The crypto winter of 2018 bottomed above the support level triggered by the double bullish accumulation of July ’17. 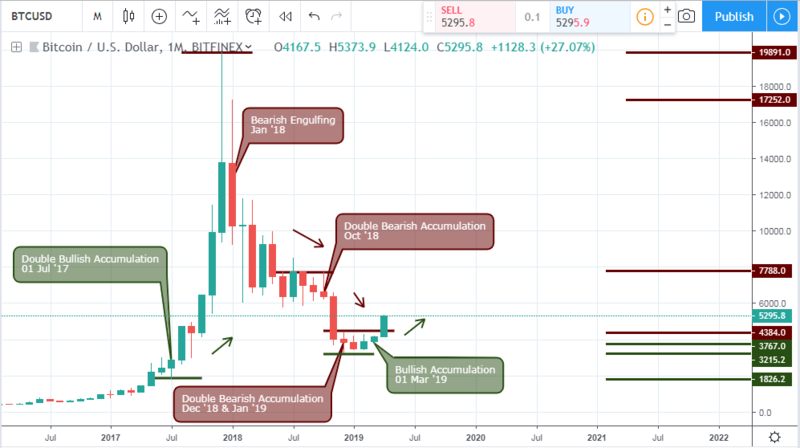 The bottoming was further reinforced by a transition from double bearish to bullish accumulation (January ’19 to March ’19). The breakout of bearish accumulation triggered on 17 December ’18 forced the BTCUSD into a triangle pattern with resistance at 4384.0 and 3215.2 respectively. 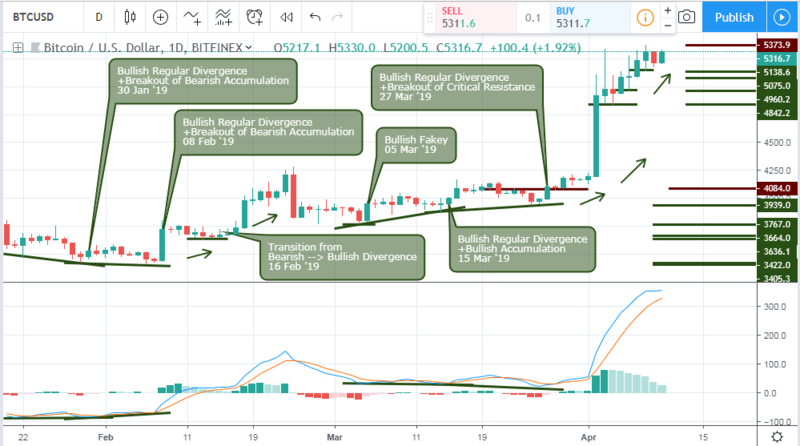 On the Bitfinex cryptocurrency platform, the pair confirmed the bullish trend by triggering a bullish accumulation on 25 February ’19, from which it skyrockets by roughly 38.1%. Coming closer to the 4hour chart, we notice the similar failure of selling pressure like the ones on the daily chart. 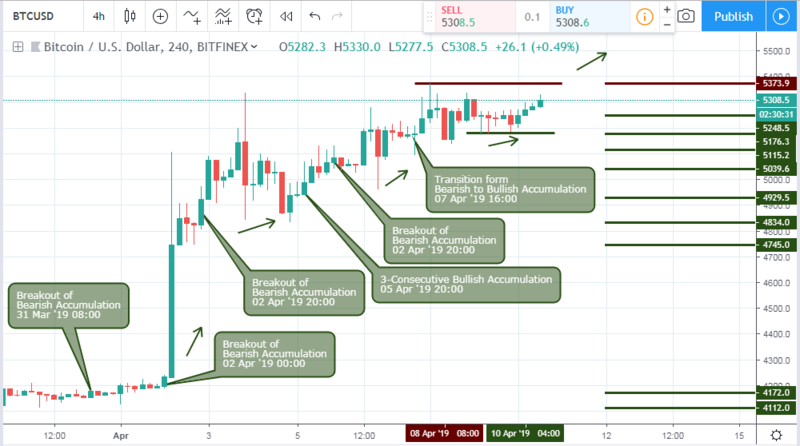 On 31 March ’19 08:00 and 02 April ’19 00:00, price broke out of bearish accumulation resistance levels to rise by 28.33%. Subsequent bullish patterns continued from 02 April ’19 20:00 to 07 April ’19 16:00 as buyers pile up more bullish trades. It is obvious, the bears have relinquished power to the bulls as critical resistance levels (4384.0) yield to bullish pressure on the higher monthly time frame. That said, in the event of a bullish price close above the mentioned resistance level, which is highly probable, we look forward to a price projection of 7788.0.